I’m a fairly big fan of Castle Crashers (probably why there’s a few tracks from it on this blog…) and when I was looking for a zombie track to put up, I realized that a) I’d already used music from WarCraft III and b) I’m not familiar with the Resident Evil soundtracks (nor do I yet have the soundtrack to ZombieSmash…maybe if it was in FLAC…). Anyway, “Swampland” from Castle Crashers is a nice ‘zombie invasion’ theme to fit this time of year. The Castle Crashers soundtrack was very interesting in that the majority of the songs were already written by artists on Newgrounds. Waterflame, a Norwegian composer, contributed several pieces, including “Space Pirates”, the forest theme, but I think this is the best piece he contributed. The other interesting thing is the tracks just don’t loop very well in-game, as they contain a very short (but noticeable) audio gap (something that I think could have easily been remedied by deleting a half-second of silence at the end of each track). In any event, the version uploaded here is actually a looped version of the original (which you can get off of Waterflame’s Newgrounds page). “Swampland” is the kind of gloomy, oppressive stuff you’d expect to find in a zombie hideaway. A deep, moaning strings section opens the track, over which is quickly layered a haunting music-box piano and atmospheric percussion from snake rattles and cymbal scrapes. The track simply seems to ooze mist and creatures of the dark places. Each instrument adds another layer to the piece until one minute in when the exotic bongo beat rises from the bubbling muck like the sloshing feet of the undead, until it rises to a chanting height for the final 30 seconds. Great stuff for fighting shuffling zombies and black knights. Did I mention this game was awesome? 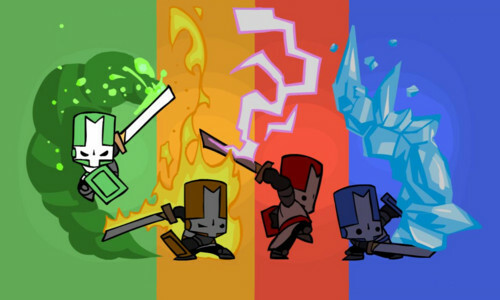 So Castle Crashers has such an awesome soundtrack that it deserves more than one Daily. Today’s is one that you may not have heard too often, the “Sand Castle” theme by indy game master-composer Will Stamper (Gish, Closure). “Sand Castle” is the theme of the…well…sand castle stage. The Moors constructed a castle made of sand in their desert land (apparently by using plastic toy shovels) and the crusading knights must take the fortress in their quest to reclaim the kindapped princesses. Watch out for the giant warriors – if you don’t have a good ranged attack, they will do some serious damage to you! Anyway, the theme is pretty soothing and trance-like, with a great drumbeat and accompanying percussion coupled with an atmospheric blast of guitars and synth line that floods the room with a waterfall of sound. It comes straight out of the desert lands to you sound system. A nice drum beat and The track is a little cooler than the outside desert theme (“don’t”) as it’s inside a building and while it isn’t really melody-based (more tone-based), it’s a wonderfully addicting piece. By the way, most of the Castle Crashers soundtrack (excepting the work by Will Stamper) can be downloaded via the Castle Crashers portal. “Dark Skies,” “Vain Star,” and “Rage of the Champions” are three of the best. Not sure why Stamper’s work hasn’t been distributed there yet, but it sure is a pity considering how good it is and how popular the game has been. “Four Brave Champions” is truly epic with a good infusion of castle storming, clashing knights, shining swords, and other medieval action. 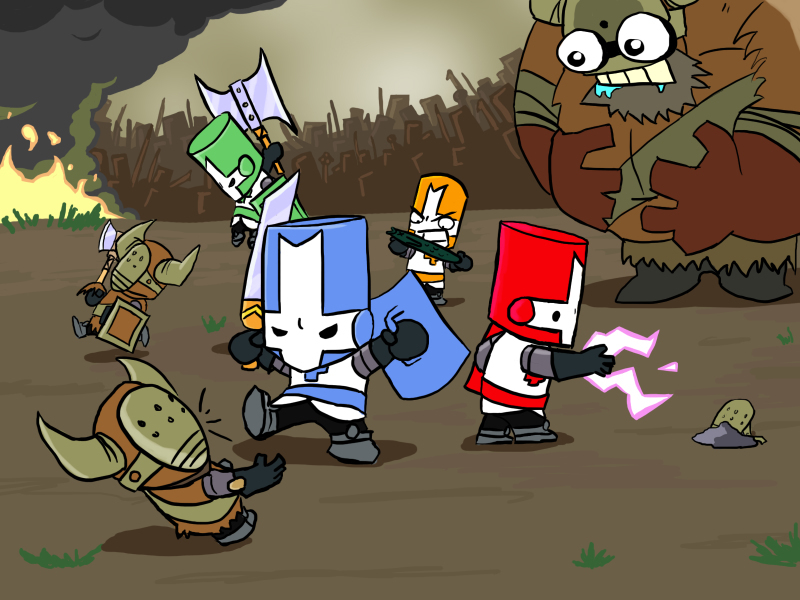 It was the product of a contest by Castle Crashers‘ developers, The Behemoth, for the Newgrounds community to produce songs that might be used in the game. In this regard, the soundtrack to Castle Crashers is pretty unique because most tracks were independently produced. Incidentally, most of the soundtrack is available through Newgrounds, but as far as I know, nobody except myself had ever compiled a complete selection of all the game’s music.